St. Augustine Foot Soldiers Monument. 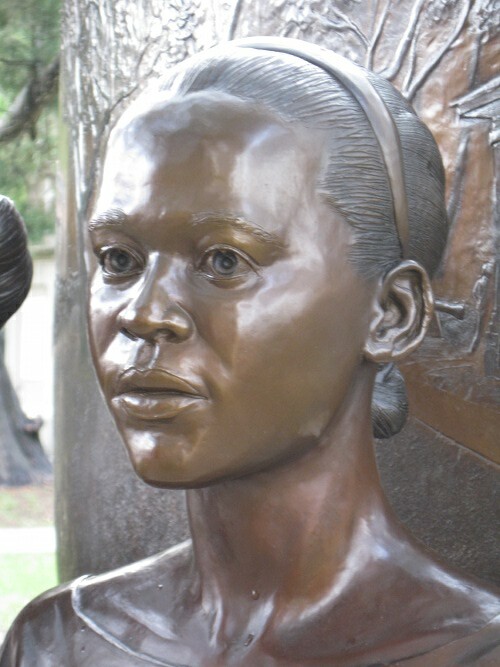 Bronze sculpture by Brian R. Owens of Deltona. 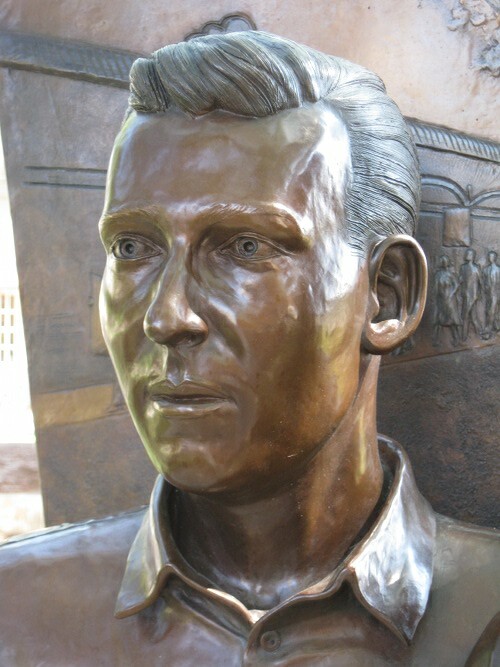 In May a bronze monument was unveiled in St. Augustine in remembrance of ordinary citizens who engaged in various forms of peaceful protest to advance the cause of civil rights there in 1963 and 1964. This was a critical period for the civil rights movement that had been unfolding in many states for nearly a decade. The citizens who marched in St. Augustine, who survived a staggering level of violence, are credited with helping to sustain the political pressure needed to pass the Civil Rights Act of 1964. Historian David Nolan describes it as “the most important event in St. Augustine’s modern history.” They called themselves Foot Soldiers. I sculpted the monument for a non-profit, tax-exempt organization founded by Barbara H. Vickers, herself a Foot Soldier. Her mission: to create a monument to honor anonymous citizen-heroes connected to events that were largely unknown outside of her city; install it on the most prominent, historic property; get it done in a time when raising private funds is a challenge, when we are at risk of forgetting our own history and perhaps, of forgetting that there is nothing that can’t be done. Vickers surrounded herself with people who knew the inner workings of city government and how to organize a project like this. 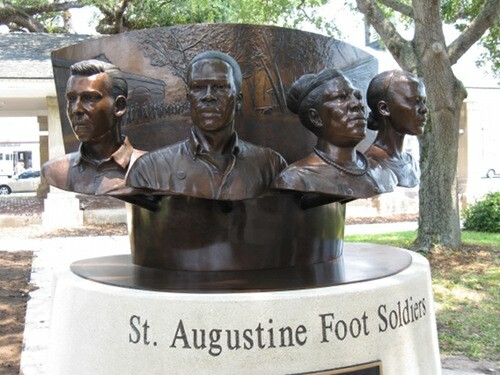 The St. Augustine Foot Soldiers Remembrance Project, Inc. was driven by a small core of people but powered by over 200 individuals and 20 companies that contributed to the project. The monument is permanently installed in the Plaza de la Constitucion, a public park in downtown St. Augustine, near the corner of King and Charlotte Streets, 40 feet from a historic structure that was once used to sell slaves. The City contributed landscaping, concrete and engineering services and is now the owner of the monument. Not all public art projects can be handled this way, but this is a method worth noting. Just after the installation, I stood around while the adhesive that connects the plaque to the stone base hardened. Two men walked up – one white and one black – seeing the monument for the first time. They were in a loud, enthusiastic discussion of how to rethink tourism, of new ways to include the monument in advertisements, of the monument as a symbol of our human ability to find creative solutions when the institutions that should protect us fail us. Neither of them was alive in 1964 and still, they connected with the art. They were so excited – so physically animated – that I had to step forward to keep one of them from accidentally knocking the plaque clean off. Now that the epoch of the civil rights movement is over, we may see it from another angle – as those two men did. It was after all, a human achievement. I suspect that, for them, black and white is a kind of TV they don’t make anymore. Green is the color that preoccupied us at the moment and it’s not the green of the natural world. St. Augustine is a city that is dependent now, as it was in 1964, on tourism. I have no crystal ball to gauge how the monument affects their economy, but I do know how much lighter my own wallet is now that my lady-friend has rediscovered the place. Shortly after the monument was featured on the statewide public radio program “Florida Frontiers,” I received a happy message from the producer with feedback. Apparently, lots of people were planning a little weekend getaway to the “oldest city in north America.” And if the metrics of my website are to be believed, then many of the people who visit my site – and it’s a big number – get a gentle invitation to visit St. Augustine as well.